A snapshot of Thanksgiving 2016. Ernesto’s cousin, Pablo, and his wife, Andrea, drove down from New York for the long weekend, and this year’s holiday was like a dream of Thanksgiving: The turkey obediently turned golden brown and was finished all the way through at the appointed hour, and every side dish from Greensboro, Chapel Hill, and Liberty was heated and on the table in proper order. Robin’s sweet potato casserole was a symphony; Holli’s mashed potatoes were a poem; my oyster dressing was warmly appreciated by a discerning few. 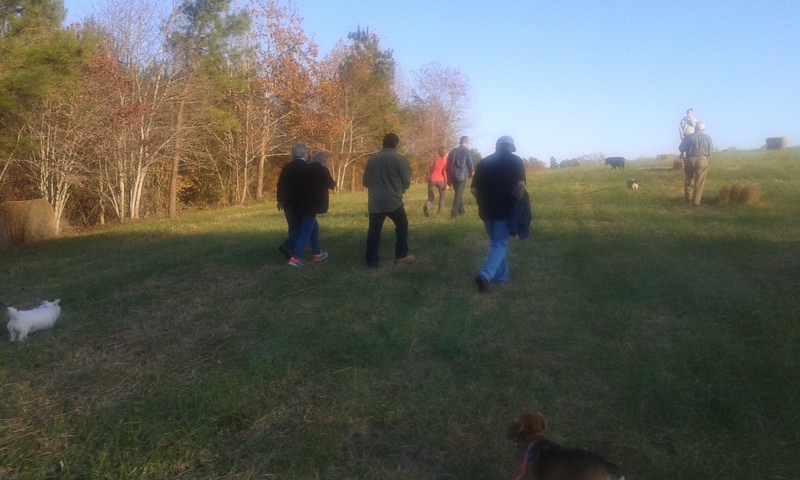 After the clean-up it was time for the annual Thanksgiving Day Hike, and ten (out of 14) people and five out of 5 dogs headed down the path toward the creek and up into the back field. Ernesto and Pablo had devised a scheme for the Friday after Thanksgiving: They wished to cook a leg of pork in a hole in the ground, Cuban style. Ernesto and my dad dug the hole a week before, finding the spot where, ten years earlier, Ernesto had roasted a pork shoulder. Daddy had kept all of the items we had used on that occasion—the metal lid for the hole, the grate to hold the pork, and four long-handled hooks (probably coat hangers in a previous life) to help lift the grill in and out of the hole. We were ready. On Friday morning, Andrea and I went to Food Lion to collect a few things for the side dishes, while Ernesto and Pablo drove straight to the farm to start the fire. There was some concern that we would be cooking deep into the night if we didn’t get it going fairly quickly. They started a second fire in the wood stove in Daddy’s shop, which could provide a continuous supply of fresh coals for the pit. What with one thing and another, it was nearly noon before the pork leg, lovingly marinated in lemon juice, garlic, and cumin, emerged from its cooler and was lowered into the pit. We were already about two hours behind schedule. Imagine the next six and a half hours, if you possibly can. Well, I know that you can’t, so I will try to give you the flavor of them. The weather was unseasonably warm, nearly 70 degrees. Ernesto and Pablo settled into chairs around the pit, sweaters and jackets came off, the two big dogs stalked around the edges of the site. We had a digital remote meat thermometer, not meant for gauging the heat of a fire pit, but it was rather nice because we could poke the metal probe through a small hole in the metal lid over the pit and let it dangle down, while the temperature gauge on the other end told us how hot it was down there. Everyone thought that the temp would shoot up to 400 degrees when we first fed it down into the hole, and we were anxious when it only registered about 275. But it was early, and we remained hopeful. Every 40 minutes or so, Ernesto and Pablo shuttled burning coals and chunks of wood from the wood stove to the pit. When the heat didn’t rise, they devised better ways of insulating the metal lid so that heat couldn’t escape. They used hoes to beat back small grass fires that occasionally erupted around the edges of the hole. They grew progressively smokier. During one of the intervals when the pork was lifted out so that coals could be added to the pit, I measured the leg’s internal temperature. It was 65 degrees. Clearly, we had a distance to go. As anxiety rose, the bucket loads of burning embers from the wood stove grew larger and more fiery. The guys had been sharing one pair of heavy leather gardening gloves, but soon Pablo appeared wearing a pair of stout black rubber gloves. “Where did you find those?” Daddy asked. Pablo said he’d seen them under the shelter, so he borrowed them. Andrea decided she would take a walk around some of the trails that we had missed the day before. The next thing time I turned around, she was holding a crude map that Daddy had drawn to show where all the trails were, and how they connected. I got out the fishing gear and headed for the pond. About 30 minutes later, I caught a bass on the artificial worm, and as word of my success reached the fire pit, Pablo and Andrea and Maggie, the black lab, joined me. Pablo hooked a bass on the fly rod, but it spit the fly out before he could bring it home. I gave Andrea the artificial worm gear, and she worked her way around the entire pond, trying to find a fish that hungry. Maggie splashed around the edges of the pond with great energy, repeatedly. Pablo returned to his duties at the fire, and I caught a bass on the fly rod he abandoned. As Andrea completed her circuit of the pond, I went back up to the fire to check on progress. I found Pablo gingerly brushing ashes off the pork leg, which was out of the pit during one of the periodic coal-fetchings. The big dogs, exhausted, lay in the cool shade by the shelter and fell asleep. Fishless, Andrea collected greens from Fred’s fall garden and snipped some of his rosemary. She spent the next hours in the kitchen, massaging kale and greens in lemon juice, then adding chopped apple and pomegranate seeds for salad; sautéing apples and onions for a compote; peeling potatoes and seasoning them with rosemary for roasting in the oven. Holli’s husband, Bobby, hung around the kitchen, no doubt wondering if he would ever be able to eat dinner and go home. “Really? One of my mom’s caregivers suggested that I get her a rosemary plant,” Bobby said. “Now that’s what I call an excellent caregiver,” I said, but Bobby said she wasn’t around anymore, because he had fired the company she worked for and found a different one. The rosemary potatoes went into the oven, and I put together a corn and cheddar casserole that was very similar to a macaroni and cheese only with corn instead of macaroni. Pablo came in periodically to instruct us on how to prepare tostones—twice-fried slices of green plantain, which between the first and second frying are smashed into round discs. We joked that the meat might not be done until midnight (or possibly breakfast), but it came into the house around 6:30, and it was lovely. Pablo and Ernesto removed the charred and somewhat battered skin, regretting its loss. By the time the table was set and the side dishes assembled, it was ready to serve. Holli donated her fluffy pink Jell-O salad, which had gone mostly untouched on Thanksgiving Day because it was forgotten in the back of the refrigerator. Afterwards, when the dishes were washed and the leftovers put away and the fluffy pink Jell-O stuff had been tasted and one or two slices of leftover pumpkin pie were consumed, we toasted the day, Thanksgiving, and each other with sparkling cider that Pablo and Andrea had brought as a hostess gift. Thank goodness we had eaten a good deal of rosemary, so we can remember it all forever. Thank you for giving the Pink Fluffy Yummiliciousness it’s due recognition (though an earlier mention would have been nice). I liked it. As I recall, Andrea said “it’s not awful.” Let me know if anyone asks for the recipe. Love the Remembrance. A placement at the end of a story gives the subject more importance. Also I was unsure how to spell “yummiliciousness.” Now the pink fluffy stuff is immortal!